Be the first to share your favorite memory, photo or story of Clarabelle. This memorial page is dedicated for family, friends and future generations to celebrate the life of their loved one. Age 88 of Owosso, passed away Thursday, January 17, 2019 at her residence. Funeral services will be held 11am Monday January 21, 2019 at Nelson-House Funeral Homes, Owosso Chapel with Pastor Marlene Webster officiating. Burial will follow at Pine Tree Cemetery. The family will receive friends at the funeral home on Sunday from 2pm to 6pm. Clarabelle was born July 11, 1930 in Corunna, the daughter of Harry L. and Florine E. (Sacker) Mallory. She married Richard Brant Tyler on July 14, 1947 in Corunna; he predeceased her in 2008. 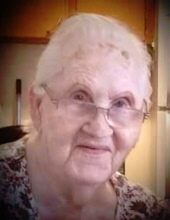 Clarabelle was a homemaker and spent her life raising and caring for her family. She enjoyed crocheting and taking trips to the casino. She is survived by her daughters Suzanne (Raymond) Palmer and Vickie (David) Marshall; 18 grandchildren; 36 great-grandchildren; sisters Erma Fisher and Joanne King; other loving family and friends. Clarabelle was predeceased by her husband and sons Richard and Roger Tyler; her parents and brothers Ralph, Rolland and Rusty Mallery. Memorial contributions are suggested to the Chesaning Nursing Home or to Memory Care at Memorial Healthcare. To send flowers or a remembrance gift to the family of Clarabelle Tyler, please visit our Tribute Store. "Email Address" would like to share the life celebration of Clarabelle Tyler. Click on the "link" to go to share a favorite memory or leave a condolence message for the family.